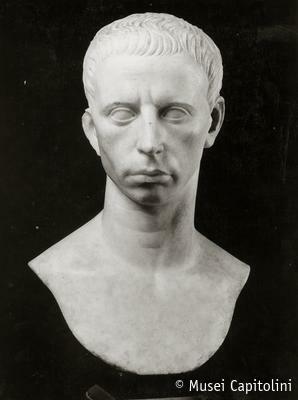 The bust, cut down at the chest, portrays a young man with protruding cheekbones and almond-shaped eyes, surmounted by arched eyebrows; the nose is hooked, the lips full and the chin receding. On the forehead the hair is arranged in short locks pointing to the right. The head can be dated to the first half of the 1st century AD. Formerly in the collection of cardinal Alessandro Albani, the sculpture was purchased for the Capitoline Museum in 1733.